Happy Tuesday! Last call for February sponsors! I'd love to have you :) Email me if you want to hop on last minute! If you didn't win any of these giveaways, go here & here to make sure you take advantage of the discount codes! Today, I get to tell you about one of our new sponsors, The Hollie Rogue! 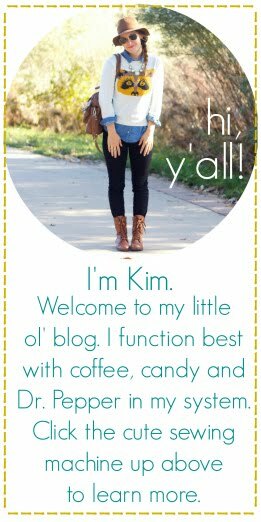 I'll let Andi take it away so you can learn more about this great blog & shop. 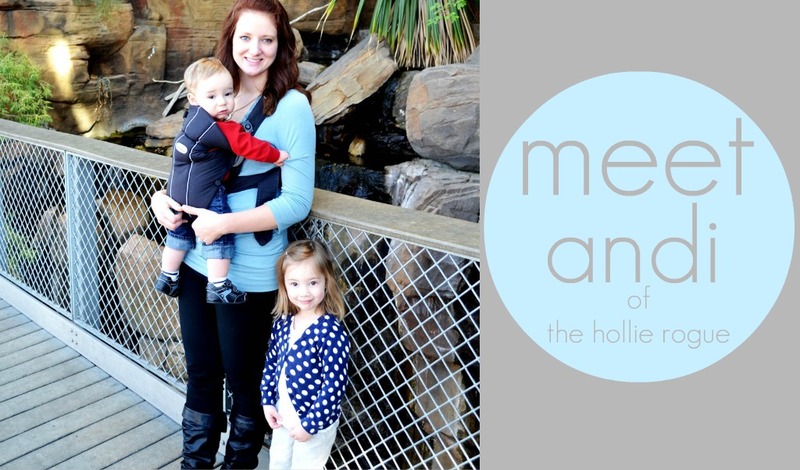 Hi, I'm Andi and I'm a wife, mom, former elementary teacher, and 1/3 of The Hollie Rogue Shop. 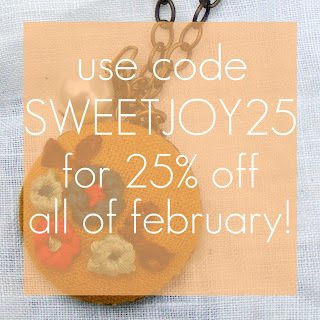 My two sisters and I opened our etsy shop in November of last year and design handmade, vintage-inspired and crocheted accessories. I love using antique pieces to create something new and updated like my typewriter key necklaces and antique earring rings. 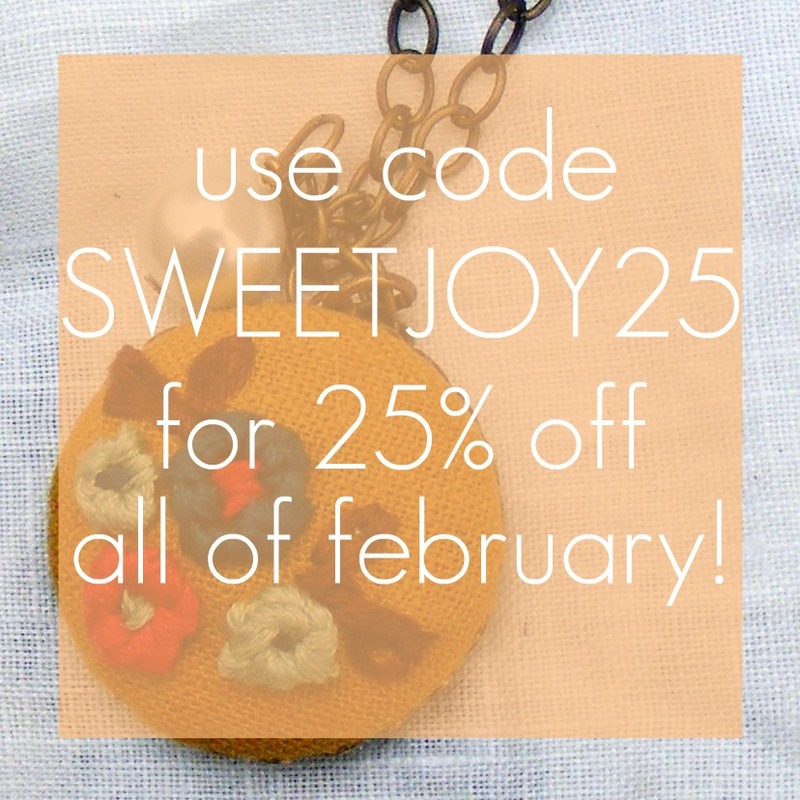 My sister, Emily, hand-embroiders gorgeous pendant necklaces (can be customized for your color choices) and my sister, Gretchen is the yarn expert. I also write about my perspective on parenting, marriage, faith, and crafting over on my blog, The Hollie Rogue. Please come say hello---new friends are my favorite! Head on over to the Hollie Rogue shop and tell me which item you'd love to have! That's a possible FOUR entries! I hope you win! Loving 02 The Gertrude: Large Green Crocheted Cowl very much! Been Oh, Sweet Joy! follower via GFC! I love The Anabelle: Lime Green & Lace Bow Cuff Bracelet! I don't know how I'd choose!! I like the green scarf or the xo bracelet! I follow Oh, Sweet Joy! Any cowl will do! Love Andi's things! Absolutely loving The Anabelle Lime Green & Lace Bow Cuff!! I'm a follower of Oh, Sweet Joy! 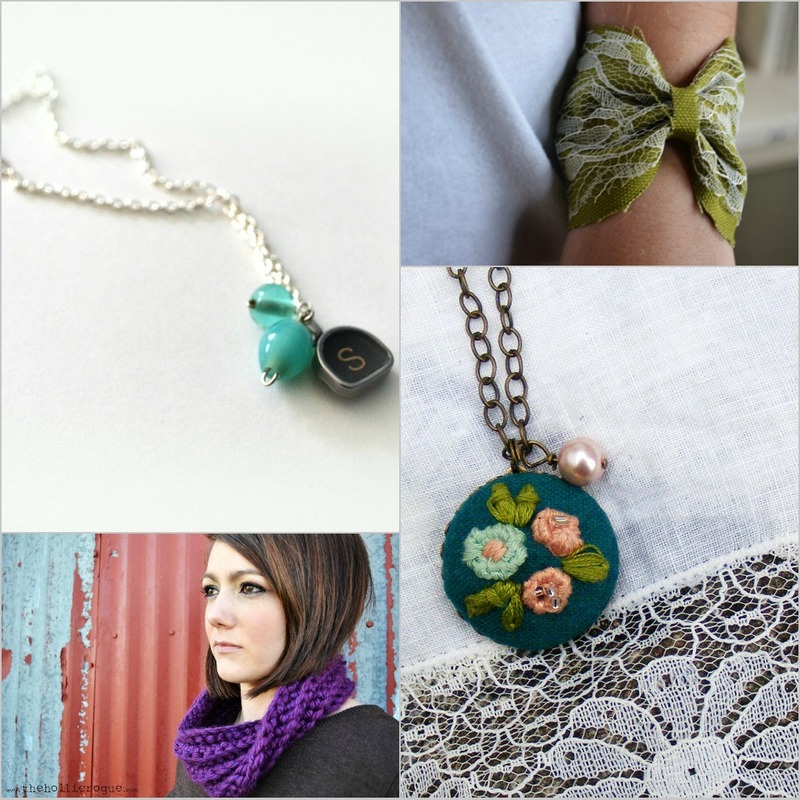 Love the June embroidered necklace! I tweeted about the giveaway. I'm @letterstomo! 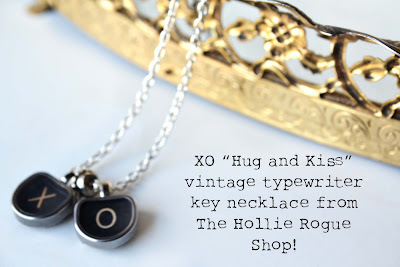 Love the X and O typewriter necklace! I love the Ethel Statement ring! It is gorgeous! I love the 03 The Ingrid: embroidered pendant with flowers on turquoise background and pearl! Following Hollie Rouge and OhSweetJoy on Twitter @MicaStaheli! I already follow The Hollie Rogue on Twitter and now follow you as well. I now follow your blog with GFC. i love the Gertrude cowl! i love all of her rings. i also love the vintage pink & white etched cab earrings. and i'm a gfc follower. I would LOVE to have The Gertrude: Large Green Crocheted Cowl from her shop!!! SOOOO cute! I love it! I follow both of you lovely gals on twitter! I now follow your blog via google connect. I love the vintage tombstone typewrite key necklace. Lovely! oops! i mean, i do follow you both, but i meant twitter too. @beforeverlovely. Seriously? Yeah, totally cannot pick just one! I am really diggin' the embroidered pendant necklaces though. Those are really unique! I'm a new follower of both of those twitter handles! Thanks for the giveaway! I tweeted about the giveaway as well! Now, I've got my fingers and toes crossed! I'm in love with the giveaway necklace. It's soo gorgeous! I followed you & @TheHollieRogue on twitter. I followed you on google connect. I would buy the purple cowl scarf! New follower of oh, sweet joy! "02 The Rebeccas: green fingerless crocheted hand warmer gloves"
I follow via GFC I think - if not I definitely get you by RSS I just can't remember which way round now ! I would LOVE the 01 vintage tombstone typewriter Single Key necklace with aqua colored beads, but with the letter J!